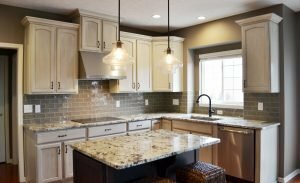 Quartz Versus Granite: Which is the Better Countertop? For years, granite has been the standard when it comes to high-end countertops. Homeowners have turned to granite to add beauty to their kitchen and add value to their homes. Lately, however, quartz countertops have become more and more popular, and we’re seeing them show up in more and more kitchens. In any kitchen renovation, cost is a concern. Granite and quartz are comparable in cost, with quartz being slightly more expensive. Granite starts at about $60 a square foot, and rises from there. Quartz can range anywhere from $67 to $93 a square foot. One of the biggest differences between granite and quartz is that granite needs to be sealed when installed, and then re-sealed periodically after that. Quartz does not need any initial or periodic sealing. This continued maintenance can figure into your overall cost. Quartz has a higher upfront cost, but granite requires more maintenance in the long-term. Because of the way quartz countertops are created, flaws in the stone are engineered out. Quartz countertops also tend to be less prone to staining than granite. With granite, any flaws or striations in the stone are a part of the look – like it or not! Things like red wine can stain granite, so keep that in mind when making your choice. Both granite and quartz are gorgeous choices for your kitchen, but there are some differences. Quartz is available in a wide array of colorings and patterns, and quartz has more of a sparkle. Granite offers less in the way of variations, but it brings a classic beauty and is easily recognized as a luxurious choice. So, which is the better choice, quartz or granite? The truth is, there is no one right answer. The best material for you is the one that fits your budget, your taste, and your lifestyle. Natural stone will never go out of style, so no matter what you choose; you’ve made a great choice. Need some guidance in choosing between granite and quartz? Reach out to us with your questions. We’d love to help guide your decision. Need to see them side by side? Stop by our showroom to see samples. Want to see how we’ve used both granite and quartz in past projects? Check out our project gallery to see some of our favorite past projects.